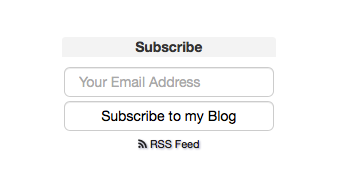 I've been thinking of adding an email subscribe feature to my Blog for a while now. Originally I thought that I'd build this functionality myself but after a lot of deliberation and research I decided that there really wasn't any need to reinvent the wheel and looked for an alternative. That's when I came across Blogtrottr. What that means is it takes an RSS feed and emails you whenever that feed is updated. It's also possible to use Blogtrottr directly on your own Blog or web site to add an email subscription feature (as described on their Help page - Can I put a Blogtrottr form on my website?). To use the above, just change YOUR_BLOG_RSS_URL to the URL of your Blog's RSS feed. The schedule_type value can also be adjusted to one of the numerical values below, however I think using '6' for a daily digest is the best approach. After placing that HTML form on your Blog, your visitors can subscribe and be kept up to date on your new posts. It only takes a few minutes to implement this but adds a whole load of value. The only down side that I could see was not having control of how the emails are sent out and not being able to manage the mailing list yourself, plus there are ads included in the emails. These are minor constraints which didn't bother me that much.